View the entire table of contents for the Mar. 31, 2011 issue. It's not exactly seismic, but it is a shift. In ever more wineries, Grenache is adding pizzazz to the California Rhône scene, contributing complexity and finesse to the state's best Syrah-based wines. Mirroring its role in the French region as an important blending grape, Grenache plays a prominent part in the success of top Rhône Valley-inspired blends such as Alban's Pandora Seymour's Vineyard, Saxum's James Berry Vineyard and Sine Qua Non's The Naked Truth, even if the grape's name doesn't appear on the labels. Wine Spectator senior edtior James Laube explains. 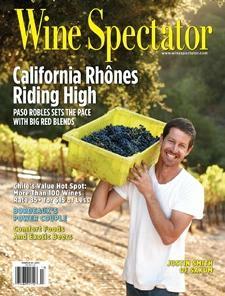 For the full article, check out the new issue of Wine Spectator, on newsstands March 1, 2011.